Select the Network Configuration option in the WAI menu. Select Network Interfaces and click the Activated at Boot tab. Click the name of the interface to add the virtual interface to, for example, eth0. Click Add virtual interface at the bottom right. Specify a number for the virtual interface in the Name field. The name must be unique across all other virtual interfaces on this real network interface. To activate the virtual interface at boot-time, select Yes from the Activate at Boot field. 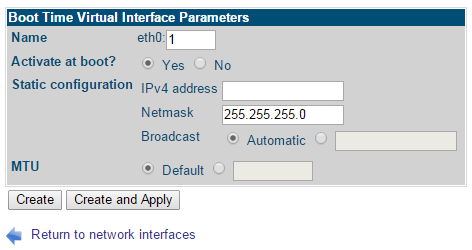 Enter the IP Address to assign to the new virtual interface. Ensure that the Netmask and Broadcast fields are set to the same addresses as the real interface. Click the Create button to add the new virtual interface. This returns you to the Network Interfaces page. You can see the new virtual interface for eth0 in the Interfaces Activated at Boot Time table. To activate the new interface immediately, click the interface name in the table, and click the Save and Apply button.